Would you like all EZRentOut alerts and emails to include more detail about your company? Maybe you’d like your internal communications to have more of a personal flair, or want to direct customers to the next steps related to a particular event. To this end, you can create custom email templates to tweak your email-based communication with your staff and customers alike. These templates can be used for actions that generate emails. To do this, you’ll first have to enable it from Settings → Add Ons → Email Templates. You can send out alerts to your staff as well as your customers. Manage these settings from More → Alerts. 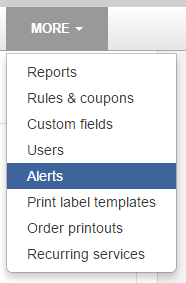 Clicking on ‘Customer Alerts’ tab on the ‘Alerts’ page takes you to the Customer Alerts Settings. On the left, you can select all the alert emails you would like your customers to receive. On the right, any alert giving the options of ‘Add New’ will let you add and edit custom templates. We will discuss this in detail later. 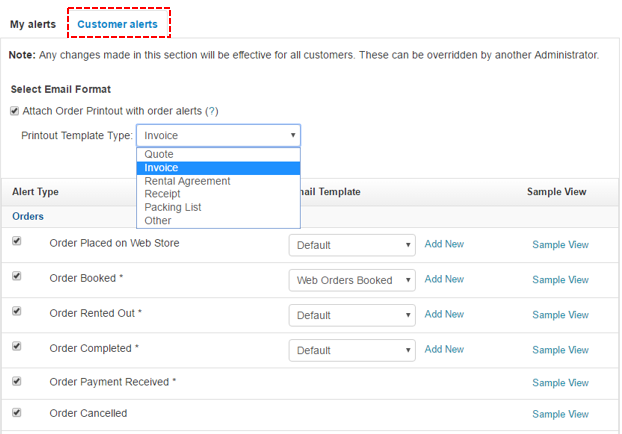 You can also attach Order Printouts with order alerts marked with an asterisk (*). Clicking on ‘My Alerts’ will take you to the Alerts Settings. You can choose email formats – for each subscribed event, for example, or just a cumulative digest summing up a recipient’s daily EZRentOut activities. Customization does not apply for email digests, which is why you will have to have ‘Email for each subscribed event’ checked. As with Customer Alerts, you’ll be able to select which alerts you’d like to send to your staff, as well as add and edit templates from this page. 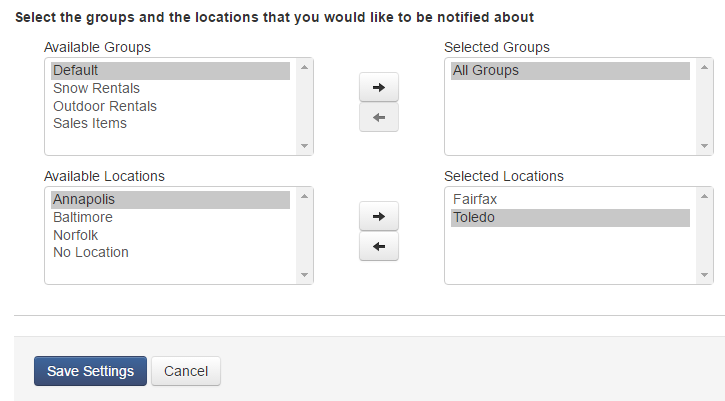 You can also select the groups and locations you would like to send alerts out for. 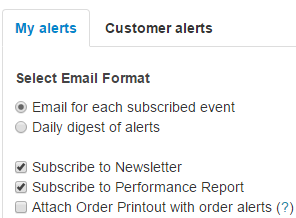 To add a custom template, go to My Alerts/Alerts for Customers → Actions that Generate Emails. 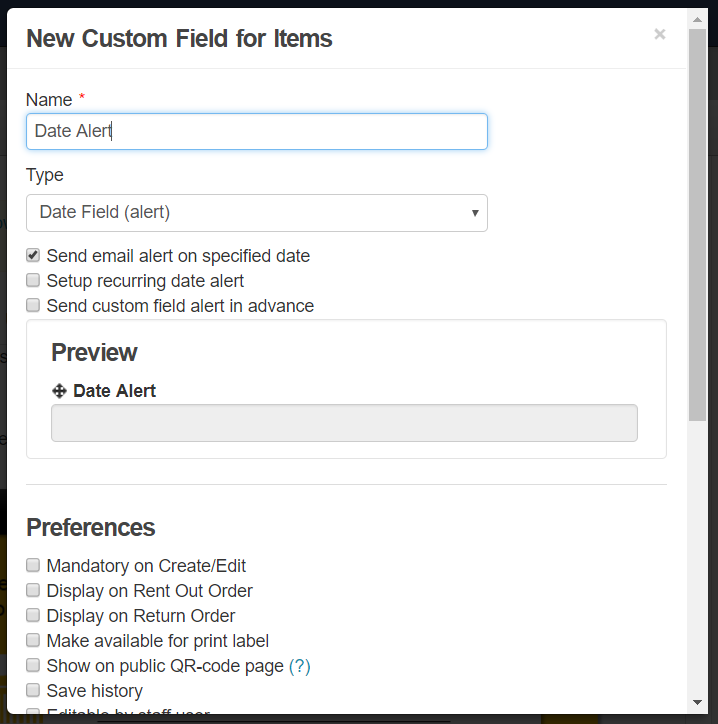 You’ll see a list of alert types followed by their email templates. Simply click ‘Add New’ to get started (see image below). This will take you to the Email Templates page. You can also access this through Settings→ Add Ons → Click here to configure Email Templates. You can click Filter on the top right to filter templates according to the action type. You can now either add a new email template or edit a template you’ve previously customized. Clicking the ‘Add Email Template’ button on the Email Templates page will bring up an overlay prompting you to build your custom template. You can choose who it’s for. You can choose what to call it, the subject that will appear in all internal communications, and the action upon which the alert will be created (see image below). You can use placeholders to draft very specific emails for your staff. These contain dynamic data such as customer names, important links, etc. Of course, these will be different for each template type. For a list of all possible placeholder options in EZRentOut alerts, click here. 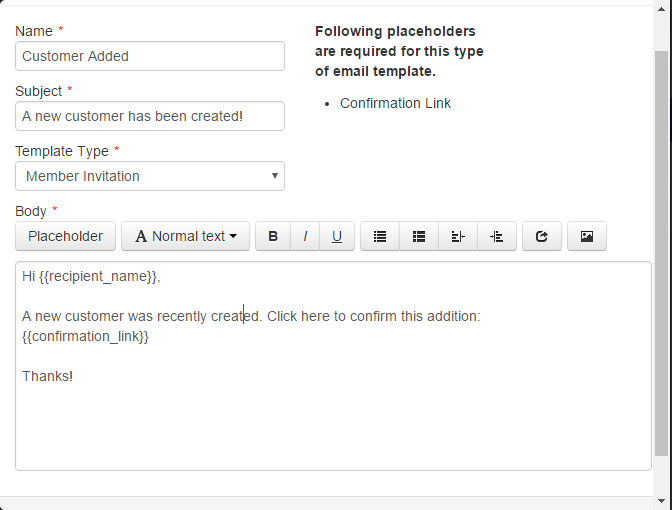 When you’re done, simply click ‘Create Email Template’. Be sure to activate your template from the template detail page to kick off the alert (see image below). Clicking on an already existing template e.g. ‘Retiring Assets’ on the Email Templates page allows you to access the template detail page at a later date. You can easily edit and delete templates here, as well as switch to the original template. If you have multiple templates for a particular action, you can easily switch between them by clicking ‘Change’ in My Alerts/Alerts for Customers → Actions that Generate Emails. This brings up an overlay where you can choose a different custom template or revert to the default. 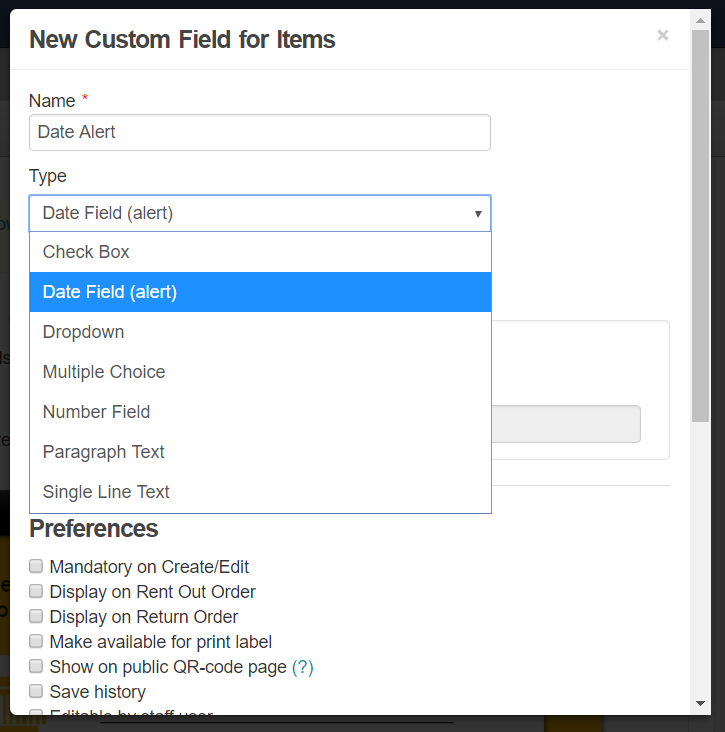 You can now add a new Email Template and choose the relevant custom field from the ‘Template Type’ drop-down to begin customizing your email. All confirmed staff members and customers receive emails based on their selected actions of interest. Staff members and customers receive emails they’ve subscribed to only when they’re involved in the action, while administrators receive emails for all actions across the company. For more details, click here. For more assistance, drop us an email at support@ezrentout.com. You can also share your ideas on our Community Forum or visit our blog for detailed support posts on our online rental software. This entry was posted in [Support], Alerts, Customize and tagged alerts, customer alerts, email templates, user alerts by admin. Bookmark the permalink.